The numerous names for uva ursi can be confusing. Many experts refer to the Arctostaphylos genus as uva ursi, but others also refer to its strains—including Arctostaphylos adentricha and Arctostaphylos coactylis—as uva ursi. The uva ursi is a low-growing evergreen shrub. It’s said to make an excellent plant for ground cover, and it grows well in rocky soils in full or partial sun. The plant grows in a wide range of terrains, including open woodlands, sandy beaches, and even in rocky soils. 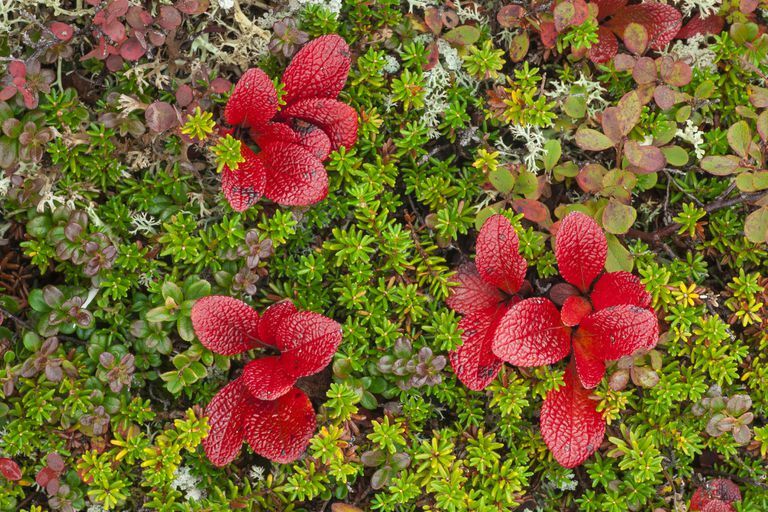 Uva ursi has reddish-brown branches with pink and white flowers that get replaced with clusters of red berries in the summer. The growing range of the plant reaches from Alaska to California and all the way to New Mexico. The plant prefers cooler Northern climates but reaches as far south as Virginia, and its Midwest geographic range includes Illinois and Nebraska. The plant thrives in several regions of the world including North America, Europe, the Iberian Peninsula, Siberia, and the Himalayas. The plant has been used as an herbal supplement since as far back as the second century. It’s most well known for its benefits in treating urinary tract infections before the discovery of antibiotics—Native Americans found the plant to be a useful, natural remedy. Today, clinical research studies provide some evidence that uva ursi may help to treat UTIs, including bladder infections; however, many experts feel that more evidence is needed to solidify the claim. The primary health benefit of uva ursi as a medicinal herb is its use in treating urinary tract infections (UTIs) and bladder infections (cystitis). There have been several studies that show uva ursi may be beneficial in treating UTIs and one study showed that when combined with dandelion root, uva ursi may even prevent recurrent UTIs. However, the study involved a very low number of participants. How Does Uva Ursi Work? Uva Ursi works to reduce bacteria in the urine because it has chemicals called glycosides. In the body, glycosides are transformed into hydroquinone, which possesses antibacterial properties. In addition, uva ursi is thought to lower inflammation with its astringent effect on mucous membranes, but the clinical research evidence does not fully support this claim. Uva ursi’s infection-fighting properties come from several of the plant’s natural chemicals, including arbutin and hydroquinone. It also has tannins, a property that enables uva ursi to have an astringent effect. This effect is what is thought to lend itself to helping fight infection by reducing inflammation. More scientific research is needed to verify uva ursi’s anti-inflammatory properties. As a topical (applied to the skin) agent, uva ursi was found to be effective as a skin lightening agent in a pilot study of healthy adults. Hyperpigmentation was inhibited in four out of six study participants who were exposed to ultraviolet light after using a topical application of a derivative of uva ursi (called arbutin). There are several common medical uses of uva ursi, which do not have enough evidence to back up efficacy claims (many of which are made by herbal product companies). One research review examined 14 over-the-counter products to evaluate each one’s ability to inhibit an enzyme that is involved with Staphylococcus saprophyticus (a common urinary tract pathogen). This enzyme is called urease. Only one of the 14 preparations in the study was able to significantly lower urease (by more than 75 percent). That preparation was uva ursi combined with green tea. Another study found that “the antibacterial and astringent benefits [in uva ursi] plus research indicating that uva ursi can effectively treat and prevent urinary tract infections, suggest this herb can be helpful in treating urinary incontinence." Uva ursi is also known for its diuretic properties—this refers to the body’s ability to flush out fluids, which helps rid the bladder of pathogens (disease-causing germs). E. coli is a common pathogen, particularly in UTIs experienced by females. Research has suggested, therefore, that uva ursi can help prevent E. coli as well. It’s important to note that although research on uva ursi's prevention of UTIs is favorable, for long-term use, uva ursi is not currently recommended as an effective prevention supplement. There are several safety measures that should be followed when taking uva ursi. Always consult with a physician or other healthcare provider before taking uva ursi because of its potentially toxic side effects, such as liver damage. Ask your healthcare provider about how to ensure (with diet or supplements) that your urine is alkaline because uva ursi is not as effective with an acidic urine (acidic PH in the urine destroys its antibacterial effect). Substances that make the urine more acidic, such as vitamin C, cranberry juice, orange juice, and other citrus fruits and juices should be avoided. Consult with a doctor to see if it's safe for you to take uva ursi at the first sign of a UTI—that is when the herbal supplement is most effective. Uva ursi is available commercially as crushed leaf and powder preparations, including tea, tinctures, and capsules to be taken by mouth. Derivatives of the plant are also used for topical skin preparations. Only the leaves are used—not the berries—in herbal medicinal preparations. Due to the potential for toxicity, a physician should be consulted before taking uva ursi. Experts recommend avoiding taking the herb for longer than two weeks (conservative sources recommend limiting the duration of uva ursi to no more than five days) and no more than five times a year. Never take more than the recommended dose or take uva ursi for longer than the prescribed duration. As a dried herb, 2 to 4 grams per day with a total of 400 to 800 milligrams of arbutin is a standard dose. To make a tea, soak 3 grams of dried leaves in 5 ounces of water for 12 hours—then strain the tea and drink it three to four times each day. Note, it is important to avoid taking too much uva ursi. According to one source, even 15 grams (1/2 ounce) of dried uva ursi leaves can be toxic in some people. Uva ursi leaves should be obtained only from indigenous plants (plants native to a particular area), according to the International Journal of Drug Development and Research. Look for products that contain 400 to 800 mg of arbutin. When buying uva ursi, or any natural herbal supplement, always be sure the product is 100 percent natural from eco-friendly sources of plant extracts. The research indicates that crude plant extracts are more effective than isolated components. Although uva ursi is available in natural, chemically altered, or synthetic forms, the natural plant extracts are recommended. No, it is not safe to give uva ursi to children. Is it safe for pregnant or breastfeeding moms? No, the safety for nursing babies and pregnant mothers has not yet been established. How can stomach upset be minimized when taking uva ursi? Try taking uva ursi with meals to minimize undesirable side effects. How can the urine be alkalized to ensure the optimal effects of uva ursi? Some herbal experts recommend taking uva ursi with calcium citrate to alkalinize the urine, but always consult with your healthcare provider before taking uva ursi or calcium citrate. What other herbs are commonly taken with uva ursi? There are several herbal combinations for bladder infections. Some preliminary studies have shown that uva ursi combined with dandelion tea could be effective in the prevention of UTIs. However, there is limited clinical research to support claims of other herbal supplements taken with uva ursi. As with all vitamins and supplements, uva ursi can potentially cause side effects. For this reason, always consult with your doctor or healthcare provider before taking any supplements. Since there is potential for dangerous side effects from uva ursi, many experts recommend taking commercially made antibiotics for urinary tract or bladder infections—antibiotics are safer and have fewer side effects. Reacher, J. (2017). Can Uva Ursi Treat Urinary Tract Infections In Men? Prostate.net. Penn State Hershey, Health Information Library Staff. Uva Ursi. Penn State Hershey. Bone, K., Mills, S. (2013) Principles and Practice of Phytotherapy Modern Herbal Medicine, 2nd Edition. Science Direct.com. Integrated Laboratory Systems Staff. (2006). Chemical Information Review Document for Arbutin and Extracts from Arctostaphylos uva-ursi. National Toxicology Program. Geetha R.V., Anitha, R., Lakshmi, T. (2011). Nature’s Weapon Against Urinary Tract Infections. International Journal of Drug Development & Research; 3(3): 85-100.